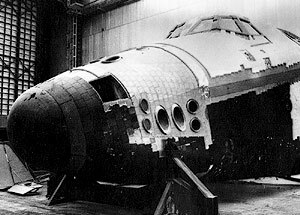 When the project was stopped, Buran 2.02 was in construction with the Tushino factory. Its completion level was estimated to 10-20%. Because of the stop of the financing it remained on the ground of the factory during years. Recently it was dismantled then put outside the hangar. A large number of its tiles were removed and are available on Internet.